Tuokkolan Touho did not leave any “IF”:s as he simply steamrolled to win Mikkeli’s Suurmestaruus (grand champion) race. His km-time in the one mile race was 1.20,8. He went with the 1.16-timed start, forced himself to the peak and went off his own way in the last curve. Driver Kari Rosimo was all smile in the parade. – The first curve was quite fast, after that Jouko Tarvainen gave me the peak quite easily. I opened Touho’s ears just in case 100m before the finish line. According to this day’s performance, Touho is my favourite for the Trotting King race, but it’s a different race, when we drive three races in two days. It’s hard to say how the horse takes it. 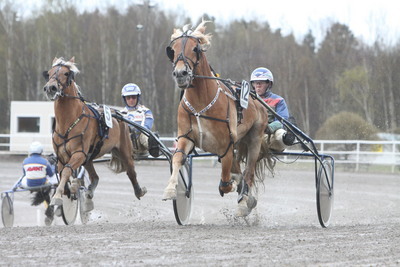 The 8-year-old stallion is owned by JMR Talli Oy and Ravitalli Suuronen Oy. Trainer Seppo Suuronen was calm even after the massive win. – After seeing this we are going for the King race with good expectations. Of course there’s still a couple of weeks to go, but this sure strengthened our faith. Suuronen still refused to take any pre-favourite pressures. – We’ll see first, if we are competing, then we’ll race for a couple of days and the Sunday evening shows, how it went. It was wonderful to win this home race. The second place went to Frans, 1.20,9 and third to Hullumies, 1.21,2.